Home/Consumer Info, Dryer Vent Cleaning, Seasonal, Uncategorized/WHY IS DRYER VENT CLEANING SO IMPORTANT? So Why Is Dryer Vent Cleaning So Important? Did you know that most home fires caused by a clothes dryer are in the fall and winter months and peak in January? Also, did you know that dryer vent fires cause an estimated $35 million in property loss each year? On the other hand, did you know that 34% of the fires caused by a dryer vent could have been prevented by proper cleaning maintenance? This is staggering! When was the last time you had your dryer vent professionally cleaned? Not only does the vent cleaning prevent a potentially hazardous situation, it also increases the efficiency of the dryer itself. The lint and debris that collects in the clothes dryer duct causes your dryer to work harder and run longer. A clogged vent could contribute to high levels of carbon monoxide or even cause a fire. Do not use the dryer without a lint filter.Make sure you clean the lint filter before and after each load of laundry. Remove lint that has collected around the drum. Make sure the exhaust vent pipe is not restricted and the outdoor vent flap will open when the dryer is operating. Once a year or more, if you notice it is taking longer than normal for your clothes to dry, clean lint out of the vent pipe or have a dryer cleaning service do it for you. Keep dryers in good working order. Gas dryers should be inspected by a professional to make sure the gas line and connection are intact and free of leaks. Turn the dryer off if you leave your home or when you go to bed. 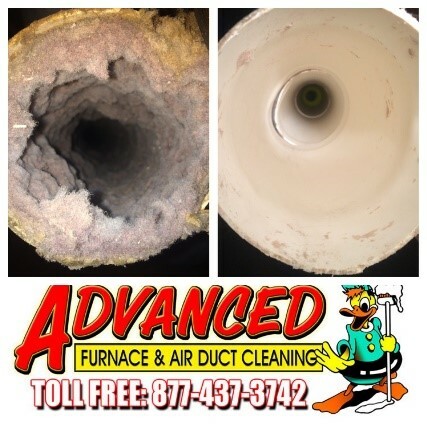 Advanced Furnace & Air Duct Cleaning has been cleaning duct work for over 52 years. We clean dryers correctly. We not only clean dryer vents from the back of the dryer to wherever it vents outside, we install covers and bird guard. Birds love dryer vents! They can build nests in the line causing serious clogs. You can discourage birds from claiming your dryer vent line as their new warm toasty home by installing the proper guard. Call us today for a free price quote! Advanced Furnace & Air Duct Cleaning works with many condo associations where it is mandatory for a yearly duct cleaning. We also have many commercial laundromats on our yearly maintenance program. Whether you are a commercial business or a homeowner, Advanced is the company for you. Give us a call today at 1(800) 317-7104 to schedule your annual cleaning!